Happy New Year! My resolution last year was to go deeper with fewer synths. It’s one of the few resolutions I managed to keep – lol. 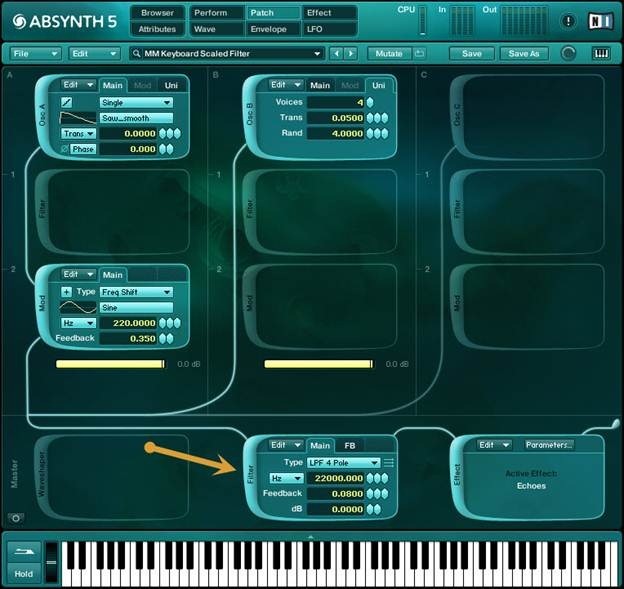 Absynth is one of the synths I focused on in 2012. While it was my first virtual instrument (started using it back in 2002 when I started migrating to computer-based music), some elements remained a mystery to me. After a year spent writing presets to use features I’d not touched, reading and re-reading the manual, watching tutorials, and forcing myself to use it it for for single-patch projects (Tracks 3 & 4 on my last album, and for this soundscape) Absynth has now become my go to “axe” for programming from INIT. Even after all these years it’s simply an amazing synth. With all that said, I thought I should kickoff 2013 by sharing an Absynth tutorial to help you discover some of the interesting features of Absynth. Goal: Change the brightness of a sound so the sound gets less bright as you play higher on the keyboard. Step 1: Add a master low pass filter to a patch. Step 2: Select Performance>Note>Param and select “Filter Freq Master”. Step 3: Use your mouse to draw a curve. You'll notice you can use your mouse to get feedback and key and scaling value. 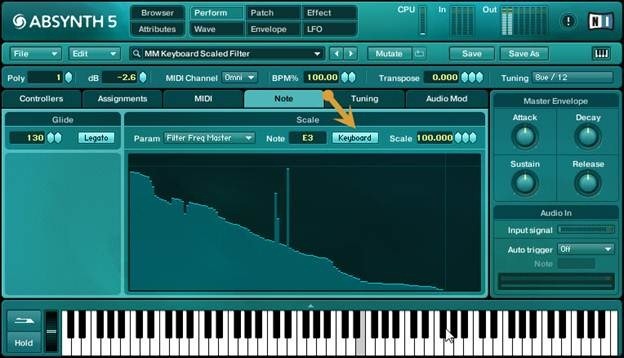 Now if you play a a note you'll hear the sound gets less bright towards the higher end of the keyboard. Tip: If you want to be even more accurate, you can do per note scaling. 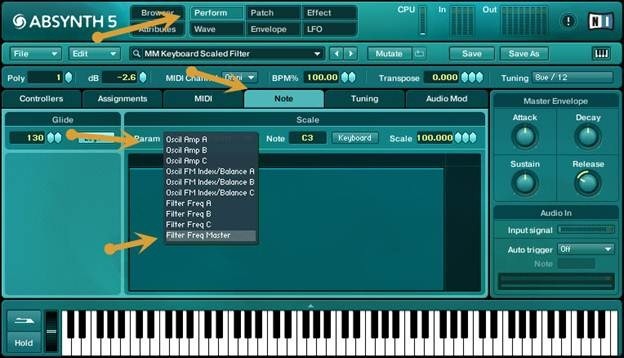 Click the keyboard button, then play a note on your MIDI controller (or use the keyboard at the bottom of Absynth. While you can now set the precise modulation value for that note. Note, the following parameter groups can be modulated by keyboard note values.